A fine image of an old tradition; from the late 1950’s/early 1960’s, this lasted until the late 1970’s, being taken over by the Skinningrove Gala Association; the event lasted until the late 1980’s. The photograph includes several members of Colin Hart’s family; the boat featured belonged to his grandfather and was used each year to transport the Gala Queen through the village to the Boatman’s Hut which is situated just before the bridge leading to the beach. 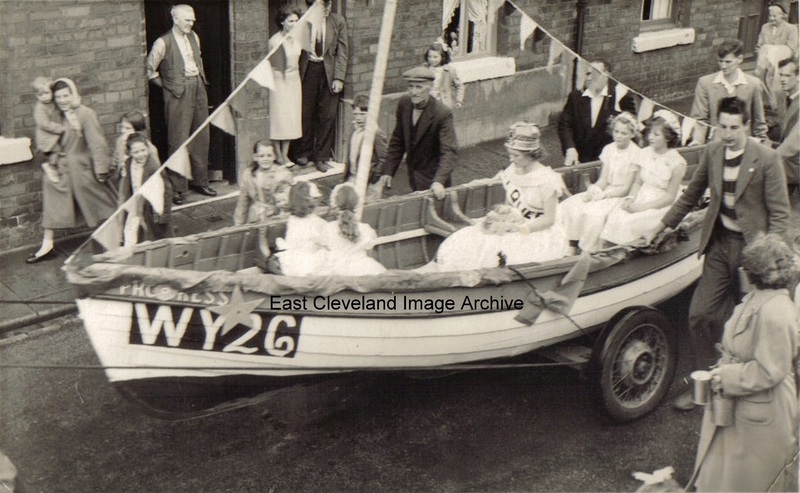 In later years the boat was replaced by a flatbed lorry; the Gala Queen featured in this image is Joan England. Image and information courtesy of Colin Hart and Pat Sparkes, with an update on the Gala Queen from John Kennedy.